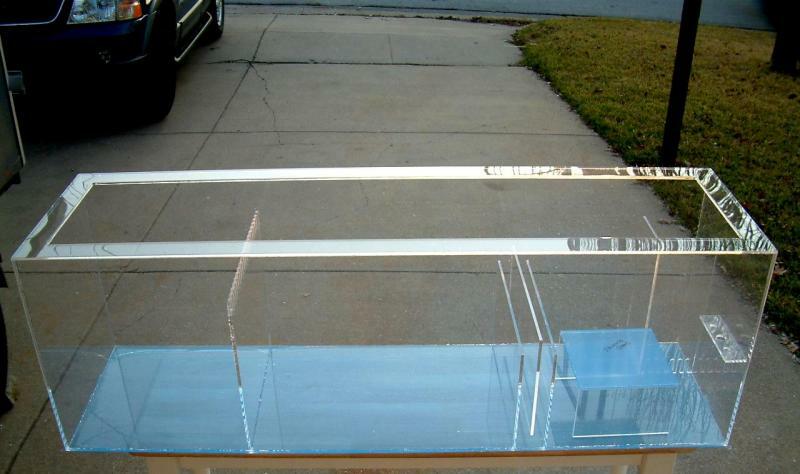 This sump is made with 3/8" acrylic and is a rimless sump. Rimless provides greater access to the various areas, but it doesn't help keep saltcreep in the sump and off the woodwork of the stand. The sump holds the ASM skimmer, a refugium, a LR zone, bubble trap & float switch to maintain the water level. The Model F design is built as seen below. Water enters from both ends simultaneously and flows into the center. A submersible internal pump in the center section will pump water back up to the tank. 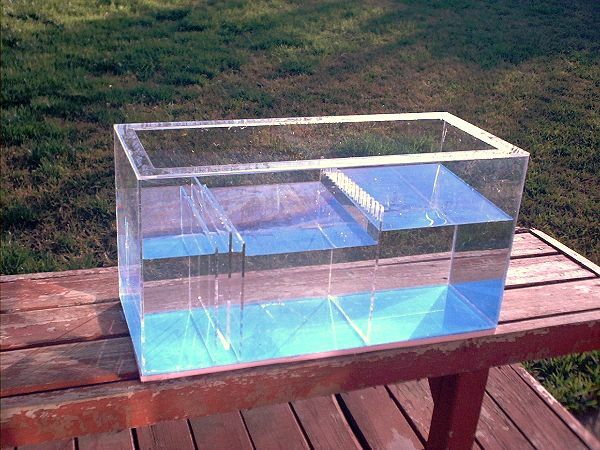 This has become the most popular of the sumps I build and is copied by many that want to make their own. I've seen stores with this similar layout under their display tanks because it provides beneficial filtration and incorporates a nice refugium zone. Smaller sumps are still practical because they hide your aquarium's equipment and eliminate the need for hang-on-back skimmers and reactors. It places the heater in an area out of sight, and you can even install cooling fans to help keep temperatures within target range. The Model E sump was designed for to hold a very small skimmer on the left. When someone likes a certain sump but wants it bigger, what happens is a new model is born. The Model F layout was what the customer wanted, but they wanted it BIGGER. The layout is the same, although there's a larger bubble tower in this particular sump so the user could place carbon in that compartment whenever he desired. This sump is designed to fit under a 200g reef. Two drainlines will be plumbed into it, with the majority of the water draining into the skimmer section and a lesser amount into the refugium. Both zones drain into the common return zone, and the water is pumped back up to the display tank with an external pump. This is an oversized version of the Model G-EXT sump. Having trouble fitting a sump under a 55 gallon Reef? After giving it some thought, I came up with a solution! When I get called to design a sump for a built-in wall unit, it's tricky. Normal home construction usually won't factor in any type of room to install aquarium filtration and the wall studs are typically in the way. Usually no matter how the stand is built, the sump just doesn't seem to fit. 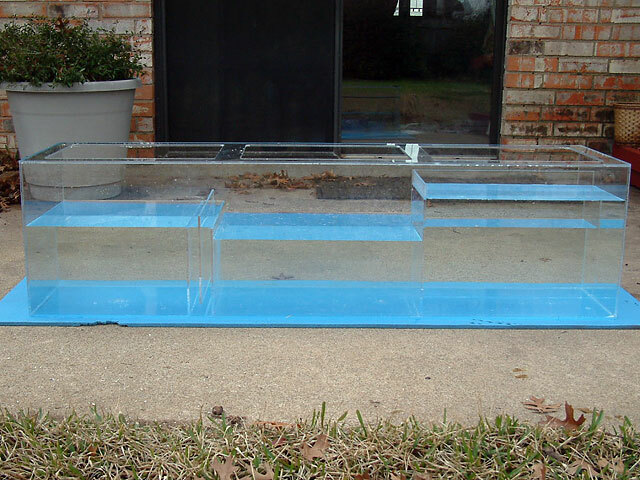 In this case, a small sump (pictured below) was installed to care for the needs of a 340g 8' long tank. After two years, and flooded carpeting too numerous to count, I was asked to build them something new that would help their reef and keep the carpeting dry. Posted 15 hours 9 min ago.